Want to know more about JESUS? NOW LISTING EVENTS FOR 2016! DO YOU HAVE A CHURCH OR COMMUNITY EVENT COMING UP THAT YOU'D LIKE TO TELL OTHERS ABOUT? WHY NOT MENTION IT ON OUR FREE EVENTS LISTINGS PAGE? A HELPING HAND: Noah and his parents, Kylie and Clint, and the cardboard house built on the day of the 'special event'. "My special event was so good! I loved making houses. Lots of my friends came and there was yummy food. We have lots of money to give the people without houses; they will be so happy." - Five-year-old Noah, whose event raised more than $1,000 for UnitingWorld's emergency relief program. When then four-year-old South Australian Noah saw a picture showing Syrian refugee children sleeping on the floor, he asked his mother, Adelaide singer/songwriter Kylie Brice about it. "Who are they? Why are they lying on the floor? Where is their bed," she recalls him asking. "So I explained to him that their houses had been destroyed and they had no-where to live..."
His response was simple: "They can come live with us!" or, failing that, that they 'Make new houses for them!" It opened the chance for Ms Brice and her husband Clint to have a discussion with him about how they could help families who couldn't come to Australia - and it was a discussion which clearly stayed with Noah. A few months later, his church - Modbury Uniting Church in Adelaide's north-east - was making 'generosity jars' after hearing the Biblical story of the widow's mite - in which Jesus commends a woman for giving all she had, no matter how little it was. When his mother asked Noah who he wanted to help, he replied "The people without houses" and so was born the idea for an event which has raised more than $1,000 to help those in need. "We got serious about putting a plan in action so we could really help those who have been displaced and decided to do a fun family event for families who have lost their home," explains Ms Brice. "Noah (who is now five) chose all the activities at the event and invited everyone to donate and/or come to his 'special event'." Around 60 people turned out for the event, dubbed Noah's HeART, which was held at the church last Sunday afternoon. Those who attended built a house out of cardboard - a symbol of how the funds raised would help - as well as took part in a range of other activities including face-painting, a children's 'disco', and entertainment as well as eating an afternoon tea together. The more than $1,000 raised has been given to UnitingWorld for its emergency relief program. 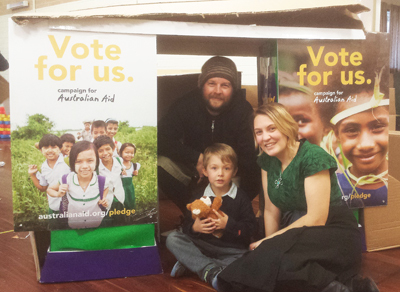 They also took the opportunity to display some posters for the Campaign for Australian Aid on their cardboard home. 'We believe that God made and loves us all," says Ms Brice, whose father Tony Goodluck, is the minister at the Modbury Uniting Church. "We are all precious to God, no matter who we are. We are very fortunate to live in Australia where we are safe and have everything we need. People who are living in poverty or war-torn countries don't deserve anything less than us - all people, especially children, deserve to have their needs met. We are in a position to show compassion and take action." Tony Milne, campaign director of the Campaign for Australian Aid - a coalition of more than 50 of the country's leading aid and development organisations, described Noah as a "real inspiration". "We know Australians are big-hearted people who care about others, and Noah exemplifies that kindness and care for others. There are a few people in politics who could learn a thing or two from Noah." And as for Noah's thoughts on the day? "My special event was so good! I loved making houses. Lots of my friends came and there was yummy food. We have lots of money to give the people without houses; they will be so happy."